This is easily the most loaded Bowman Product of ALL TIME! The official start of prospect-collecting season, 2019 Bowman Baseball coincides with the 30-year anniversary of the brand's reboot in 1989. Like 2018, formats include Hobby boxes with one autograph and Hobby Jumbo boxes with three autographs. 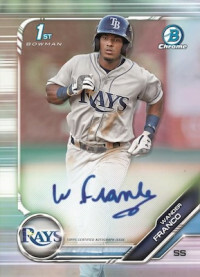 The Bowman Baseball brand continues from 2018 Bowman Draft. Spreading the coverage to MLB veterans, rookies and prospects, the 2019 Bowman Baseball checklist offers a base set with eight paper parallels, including Purple and the Hobby-exclusive Orange. Adding another option, the Bowman Chrome Prospects line features a whopping 17 Refractor parallels. Among the choices are Blue Shimmer and the all-new Speckle versions. 2019 Bowman Baseball also features multiple insert sets. While the name hardly rolls off the tongue, 30th Anniversary of the Return of Bowman looks back to the 1989 design but for current players. Ready for the Show predicts the top prospects soon to make a splash in the big leagues. Both of these have exclusive Orange Refractor parallels in Hobby boxes. Spotting the ROY standouts, Rookie of the Year Favorites focuses on the names that might earn hardware after the season. These have new Atomic Refractors. Collectors can also find Bowman Scouts' Top 100 and Talent Pipeline inserts, each with five parallels. Finally, a new year of the set-within-a-set insert kicks off via Hobby-only 2019 Bowman Sterling Continuity. However, the key chase in the 2019 Bowman Baseball checklist comes from the on-card Chrome Prospect Autograph lineup. Among the 13 Refractor parallels are Goldcards and the debut Speckle editions. RC players earn similar treatment in the hard-signed Chrome Rookie Autograph set. Collectors must track down seven parallels to complete the rainbow. Additional 2019 Bowman Baseball autographs come in 2019 Bowman Sterling Continuity Autographs, All-American Game Autographs, Dual Bowman Chrome Prospect Autographs, ROY Favorites Autographs, and six-panel Ultimate Autograph Book cards with 24 signatures, plus 1989 Bowman Buyback Autographs.